“The voiceover narration . . . When I was contacted by Jon Guilbert of Gandy Dancer Productions in 1999, he was at work on a “great trains, great chefs” travel series for PBS. The footage had been shot. He had some splendid visuals and dynamic on-camera celebrity chefs—but no narrative thread. My role was to provide a cohesive storyline, to add clarity, depth, and texture to Guilbert’s collage of images—incorporating along the way the distinct voices and commentary provided by each tour guide, four of America’s favorite chefs. 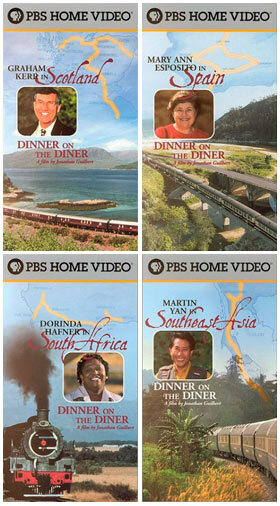 “The series combines the best of travel with the best of food,” says producer Jon Guilbert. Dinner on the Diner has aired numerous times since its initial release. It is also available through PBS Home Video. Excerpt #2 | The Signalman: In this excerpt, host Graham Kerr visits the Nairn railway station, famous for its quarter-mile long platform. “By some quirk of history, the two boxes at either end are linked not by wires but by human endurance. Twenty trains pull in and out of this station each day, and the signalman, Sandy, cycles back and forth for every one of them—more than eight miles each shift—rain or wind, sleet or snow, controlling the comings and goings of these trains on his 12-speed bicycle.” Sandy’s platform is also the site of crates piled high with fresh ingredients headed for the train’s kitchen–and then on to the Royal Scotsman’s dining car.